Central heating and domestic hot water controls are key to providing a comfortable living environment and minimising costs through increased efficiency. There are many different kinds of heating and hot water controls available today. From simple plug-in timers that tell your boiler when to switch on and off, to internet connected controls that fully modulate your heating system and can be controlled on the go from a smart phone or tablet. Controls offer flexibility and are essential for systems that combine multiple components. For example, if a boiler is combined with an air-to-water heat pump, the control can tell whether the boiler or heat pump is the most efficient at that moment in time. You simply set the desired temperature and time and the control takes care of the rest. 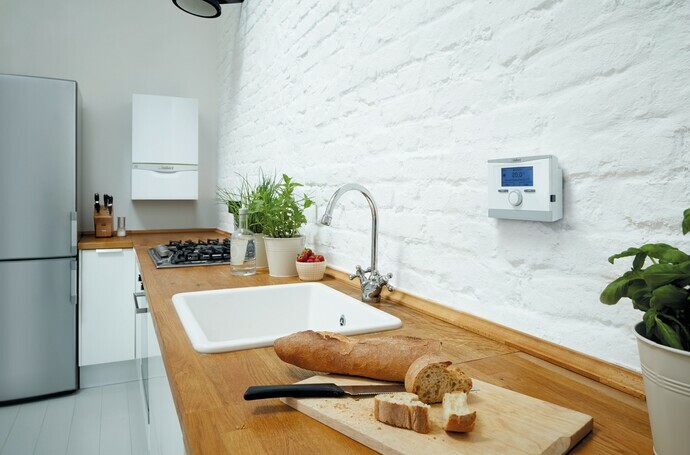 Vaillant heating controls ensure that your system works as efficiently as possible, whilst helping to save energy. For example, a weather-compensated controller automatically adjusts the temperature of the heating in-line with the outside temperature. Heating times can also be individually adjusted, so that if you’re going away, the temperature can be lowered and programmed to heat up again in time for your return. You can now control your heating system remotely, over the internet using a Smartphone or Tablet. This technology also means a heating engineer can optimise your system and carry out adjustments remotely. To find the perfect solution for your home, speak with your local Vaillant heating installer for further advice and support.